A string of downfalls of communist governments in Eastern Europe in late 1980s was branded ‘velvet revolutions’ for being peaceful. But in Romania the transition was horrendously bloody, both for the country and its dictator Nicolae Ceausescu. 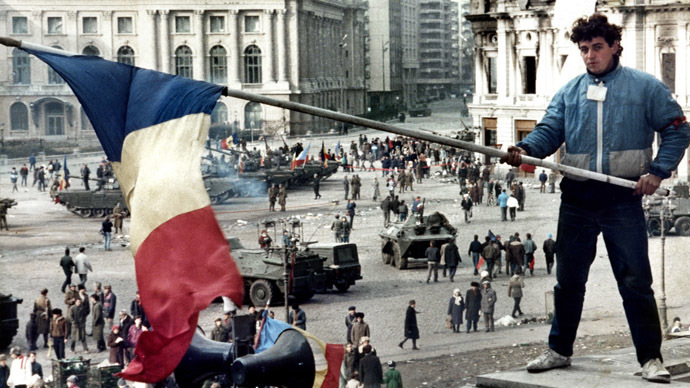 On Christmas Day, Romania commemorates the 25th anniversary of the revolution that claimed over 1,000 lives in street gun battles, and included a lightning-swift trial and execution of Ceausescu and his wife. December 21 was the day when Romania’s communist leader Nicolae Ceausescu delivered his last public speech outside Palace Square in Bucharest, in a failed attempt to quell the protests calling for an end to his rule. 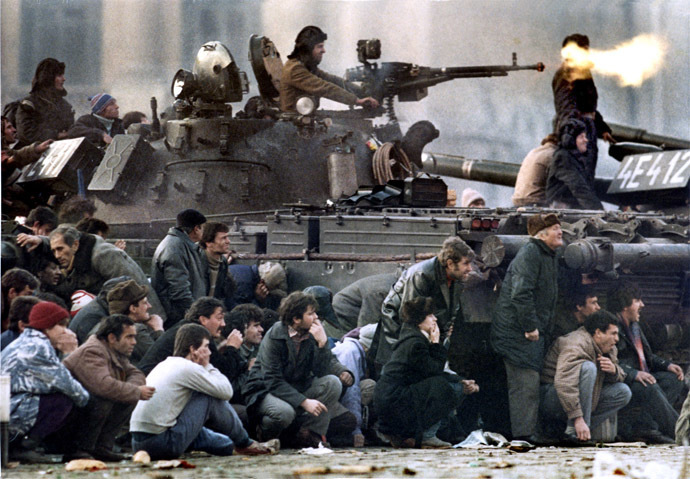 The mass unrest started on December 16, 1989 in Timisoara, a city in the country’s west that housed the Hungarian minority increasingly persecuted by Ceausescu. An uprising there was fueled by the government’s attempt to evict a Hungarian Reformed Church pastor; reports at the time estimated that between 4,000 and 10,000 people were killed as forces were dispatched to deal with the protests. Government figures said 97 lives were taken. In general, dissent with Ceausescu had been accumulating, as the country was living in impoverished conditions which included a lack of proper food or shelter. An austerity policy was imposed to pay off Romania’s debts. 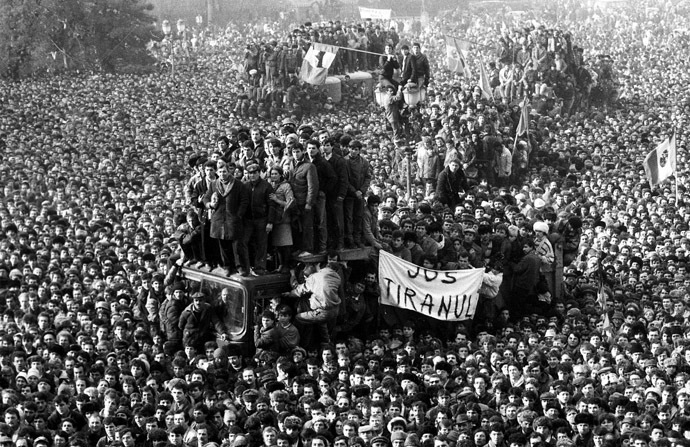 During a massive rally outside Bucharest's Palace Square on December 21, 1989, Ceausescu addressed the protests in Timisoara in a speech he delivered from a balcony. Such speeches were an annual event televised across the country. But this time the Romanian dictator’s expectation of usual cheers and applause was unmet. The people remained unmoved with his words; many booed, set off firecrackers, and began leaving the square before Ceausescu finished. On December 22–23, Bucharest residents remained in the streets as sporadic fighting erupted between protesters and police. Heavy military equipment, including tanks, arrived to the city center to patrol troubled areas. They would not be withdrawn until December 27. With the unrest flaring and army commanders defecting, Ceausescu fled Bucharest by helicopter – but was soon caught and eventually arrested, together with his ardent communist wife, Elena. The trial took place on Christmas Day, 1989. Among the charges were genocide by starvation, lack of heating and lighting, “suppressing of the soul of the nation,” and the illegal gathering of wealth. By the orders of the interim government, the ruling couple was sentenced to death by firing squad. The immediate execution, the last in Romania to date, was recorded and aired on local TV channels as proof of their demise. Following his death, power in the country was taken by the opposition and protesters, who established a governing body under the name National Salvation Front. Fighting with army units who did not acknowledge the new regime led to the deaths of over 900 people, both soldiers and civilians. Over 2,000 were wounded. In May 1989, the National Salvation Front won elections by a landslide, going on to put through a series of economic and democratic reforms. Ever since, Romania has become more aligned with the West, its democratic reforms allowing it to join NATO in 2004 and the EU in 2007. However, Romania is still struggling economically. According to the Word Bank, it has the EU’s second-highest rate of risk poverty or social exclusion, affecting 41.7 percent of the population.